Dr Sabrina Cohen-Hatton has been a firefighter for eighteen years. She decides which of her colleagues rush into a burning building and how they confront the blaze. She makes the call to evacuate if she believes the options have been exhausted or that the situation has escalated beyond hope. She has managed emergencies that have shocked us and moved us, and made decisions that seem impossible. Taking us to the very heart of firefighting, she reveals the skills and qualities that are essential to surviving - and even thriving - in such a fast-paced and emotionally-charged environment. And she immerses us in this extraordinary world; from scenes of devastation and crisis, through triumphs of bravery, to the quieter moments when these assumed heroes question themselves, their choices, and decisions made in the most unforgiving circumstances. Ultimately, we are asked to step into their boots. In the face of urgency and uncertainty, would you respond analytically or trust your instincts? How would you decide who lives and who dies? Sabrina's award-winning research into decision-making in the emergency services has transformed policy at a global level. This is her astonishing account of a profession defined by the most difficult decisions imaginable and by overwhelmingly challenging situations. Honest, eloquent and empowering, here is the truth about how we respond in our most extreme moments. 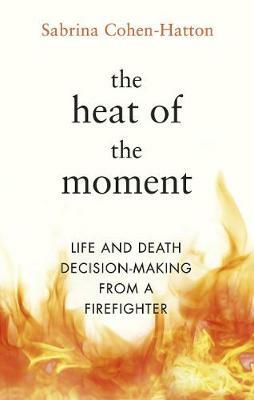 A compelling blend of personal memoir, the study and development of smarter thinking and the sheer bravery of firefighters, In The Heat of the Moment is the result of a lifetime’s work from one of the UK’s most senior firefighters. The bravery of firefighters is something we all rely on, and reading this book will make you better understand the urgent, high-risk choices they make in life-threatening situations. Never have I felt so in awe of an author, and the profession she so skilfully represents in her writing.